Your daily scoop of what State of the Union is watching today, June 12, 2014. 1. The next House Majority Leader. House Majority Whip Kevin McCarthy (R-CA), appears to have the inside track to replace Eric Cantor. Cantor, who lost in a stunning Republican primary upset Tuesday, announced a day later that he would step down as majority leader. McCarthy's path to become the House's number two Republican was made easier after Rep. Jeb Hensarling (R-TX) and chairman of the House Financial Services Committee, said he would not seek the post. 2. The David that defeated Goliath speaks. Dave Brat has been keeping a low profile since his surprise defeat of Cantor, but CNN managed to catch up with the Randolph-Macon College professor, who shied away from talking policy. "I'm just humbled that the people spoke and I think they want a new direction in Washington, D.C.," said Brat. "So if they think I'm part of that, I'm absolutely humbled by the vote - that's what I ran on, so I'm going to continue to meet with people from every spectrum out there in the 7th district, and I'll do my best to stay true to the pledges I made." 3. Immigration reform. It is an issue that is believed to have played a role in Cantor's defeat because of his support of limited reform measures. So is immigration reform effectively dead? Not necessarily says one House Democrat and immigration reform advocate. "Immigration reform is not dead. It might just be moving to the White House for action if none comes from this House," said Rep. Luis Gutierrez (D-IL). The Senate passed a bipartisan comprehensive immigration reform bill last July, but House Republicans declared that measure dead on arrival. 4. Iraq deteriorates. The U.S. could be drawn back into military involvement in Iraq as a militant group makes its move on several areas of the country. The Islamic State in Iraq and Syria already controls the city of Mosul and is moving toward Baghdad. The Iraqi government says it is pushing back against ISIS but indicated its openness to possible U.S. airstrikes against the jihadists. President Obama said Iraq needs more help from the U.S. and the international community. "I don't rule out anything because we do have a stake in making sure that these jihadists are not getting a permanent foothold in either Iraq or Syria, for that matter," Obama said Thursday during a White House meeting with Australian Prime Minister Tony Abbott. 5. Bush 41 turns 90. Former President George H.W. 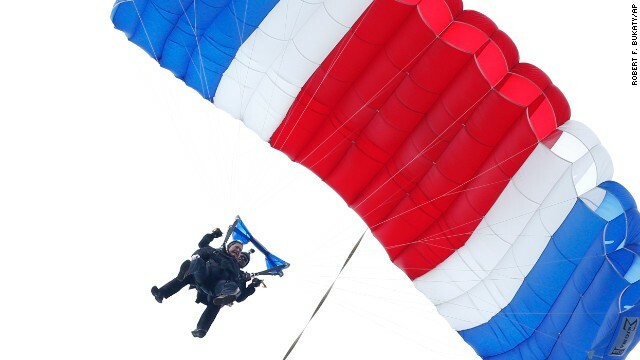 Bush celebrated turning 90 years old by skydiving near his summer home in Kennebunkport, Maine. Bush spokesman Jim McGrath said the 41st president was "doing great," after the Thursday morning jump. "He loves the adrenaline. He loves the jolt. He loves the thrill," McGrath said. Happy birthday and happy skydiving Mr. President.